The Bible is a grand narrative, a series of interconnected stories revealing God and his purpose. It is the story of God’s glory and mankind’s redemption. The Bible includes the accounts of many people, who live like sheep without a shepherd, each going their own way. When people are wayward, they experience brokenness; it is something that we all have in common. 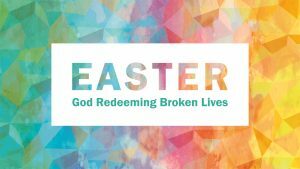 However, there is a common solution for our brokenness, which the narrative of the Bible reveals, culminating in Easter. We have all separated ourselves from God by sinning against him and his holy ways. Our sinful attitudes and actions bring brokenness to our lives and the lives of people around us. It is true that the errors and sins against God and people cannot be undone, but the message of the Bible is that brokenness does not equal hopelessness. The God of the Bible is the God of hope. He has the power and resources to redeem and restore you. Redemption is an ancient practice that is used by biblical writers to illustrate God’s work to save us from our brokenness and to restore our lives. “Redeem” is a term describing the practice of ancient patriarchal leaders. In the ancient world, extended families lived together and were guided by and provided for by the family leader, the patriarch. Redemption is to seek out a loved one, who, for an intentional or unintentional reason, is outside the father’s household, in order to bring him home, no matter the cost or effort. God is a redeeming God. His redemption is promised and demonstrated throughout the Bible. In ancient times, when a patriarch died, a double portion of his resources went to his oldest son. The son would be honored to continue the redemption ministry of his father and glorify his father by using the resources for redemption purposes. Redemption stories in the Bible are meant to point us to greater truth, an eternal truth. The narratives give us an understanding of the eternal plan of God to redeem people from all over the world. God’s purpose is to seek those who are distant from him and his household and bring them to himself. The religions of the world try to move people towards a god, but the one true God, the God of the Bible, moves towards people to save them and lovingly bring them into his household! God desires you. He has purposed that you would live in his household—to be his son or daughter. His household is holy, righteous and glorious. It is a place without sin, sorrow and sickness. God the Father, commissioned his Son, Jesus, to seek and save you—to redeem you. The purpose of the cross was for Jesus, the Son of God, to redeem lost people, to bring them into his Father’s household. Jesus is seeking you. He has paid the penalty for your sin and he lovingly encourages you to come into the Father’s house. He does this for everyone, but each one must willingly return with him. To come into God’s household, you’ll have to deny yourself, humble yourself and follow Jesus. The Lord is coming again. It could be today, tomorrow or another time; only God knows when. When he returns, those who are in his household will live eternally with him. However, those who are not in his household will be eternally separated from him in a place of torment.